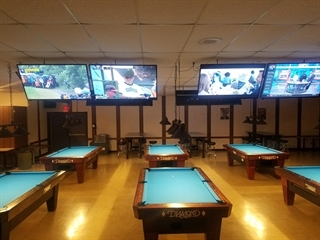 Monday 4 person 8-ball Sussex/Pewaukee travel league. Tuesday Just for fun partners league, in house. Monday & Wednesday Co-Ed Waukesha City league. Customers are coming to play pool from southeast Wisconsin communities, such as: Brookfield, Brown Deer, Colgate, Germantown, Hartford, Hartland, Lannon, Lisbon, Menomonee Falls, Oconomowoc, Pewaukee, Sussex, and Waukesha.